CompTIA A+ is accredited by ANSI to show compliance with the ISO 17024 Standard and, as such, undergoes regular reviews and updates to the exam objectives. The following CompTIA A+ 220-801 exam objectives result from subject matter expert workshops and industry-wide survey results regarding the skills and knowledge required of an entry-level IT professional. The percentages in this document represent the relative importance of the subject areas (domains) in the associated body of knowledge, and together establish the foundation of an entry-level IT professional. Candidates are encouraged to use this document to guide their studies. The table below lists the domains measured by this examination and the extent to which they are represented. The CompTIA A+ 220-801 exam is based on these objectives. CompTIA A+ is accredited by ANSI to show compliance with the ISO 17024 Standard and, as such, undergoes regular reviews and updates to the exam objectives. 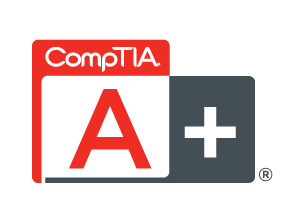 The following CompTIA A+ 220-802 certification exam objectives result from subject matter expert workshops and industry-wide survey results regarding the skills and knowledge required of an entry-level IT professional. The percentages in this document represent the relative importance of the subject areas (domains) in the associated body of knowledge, and together establish the foundation of an entry-level IT professional.